A militant group holding two Pakistani contractors hostage said it had killed the men, but freed their Iraqi driver, according to the Pan-Arab television station Al-Jazeera. 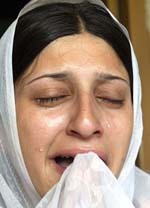 Roma Naeem, sister of Pakistani Sajjid Naeem killed by kidnappers in Iraq, weeps at her home in Hurna Mehra village north of Islamabad on Thursday. Shouldn’t Maninder Pal Singh Kohli's extradition to UK be expedited? 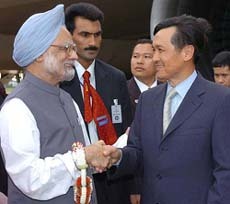 Prime Minister Manmohan Singh today exhorted overseas Indians to have a re-look at India as an investment destination and asserted that emergence of India as a global powerhouse had come. The government will announce new Electricity Policy by the end of next month that will focus on rural electrification, reliable and cheap power supply across the country through competition between public and private sectors and additional power generation. Former Miss India Nafisa Joseph died under mysterious circumstances in her flat in suburban Bandra tonight. Controversial Nihang chief of Taruna Dal Baba Ajit Singh Poohla was arrested today from his headquarters at Jhutha Kartarpur, near here, in a joint raid conducted by the Nawanshahr and the local police with active support of ex-servicemen. The Jharkhand High Court today directed the elusive JMM chief Sibu Soren to surrender in the Jamtara court on or before August 2 in connection with the 1975 Chirrudih massacre case failing which action would be taken against him. Samajwadi Party leader Amar Singh has launched a scathing attack on the Congress and its President Sonia Gandhi, charging her of cold-shouldering him and said he “felt-ashamed” that he went to the dinner hosted by the Congress President ahead of the formation of the UPA government. In an attempt to pave the way for Maninderpal Singh Kohli's early extradition, the Punjab Police has reportedly decided to approach the Kharar court for ending his police custody ahead of time.